We have already seen Numbering plans online tool to trace details of any phone number throughout the world. Incase you are looking for details of an Indian mobile phone, then checkout online trace tool at Bharatiya Mobile website. This online tool helps track location and mobile operator of specific mobile phone anywhere in India. 1. Open Bharatiya Mobile Trace tool website. 2. Enter the 10 digits mobile phone number. 3. Click Trace button to see details of specified mobile phone number. 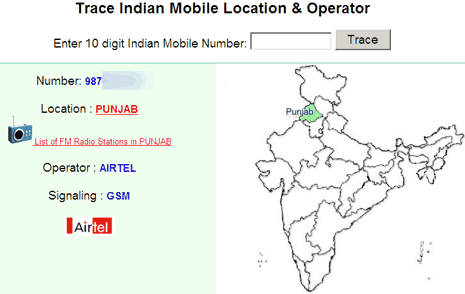 It shows location (also marked on Map of India), mobile operator name and type of mobile technology among GSM, CDMA etc. One handy tool to check on details of any Indian mobile phone, like it? Now Access Orkut on Mobile, ready for quick scrap ?